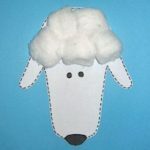 This adorable Paper Loop Lamb will be a favorite for the kids to make and you probably have all the materials in the house already. This also make a great Sunday School project. Trivia: The first sheep were brought to North America by Spanish soldiers under the command of Cortez in 1519. To make this cute Paper Loop Lamb, cut a 2" strip of card stock. Glue in a loop. Cut ears out of card stock. Glue behind loop sticking out as shown in picture above. Draw on a face. If you are looking for a little playmate for this little creature, make a Paper Loop Chick to keep her company.